As part of the Hearts in the Hamlet town-wide event taking place in Roxbury on Sunday, February 15, the Roxbury Arts Group is partnering with the MARK Project to offer a free performance by Three Friends in the Walt Meade Gallery. In addition limited general admission seating there will be family-style seating available for anyone dining-in. Dinner will be available from the Ate.O.Ate Gourmet Food Truck parked across the street. 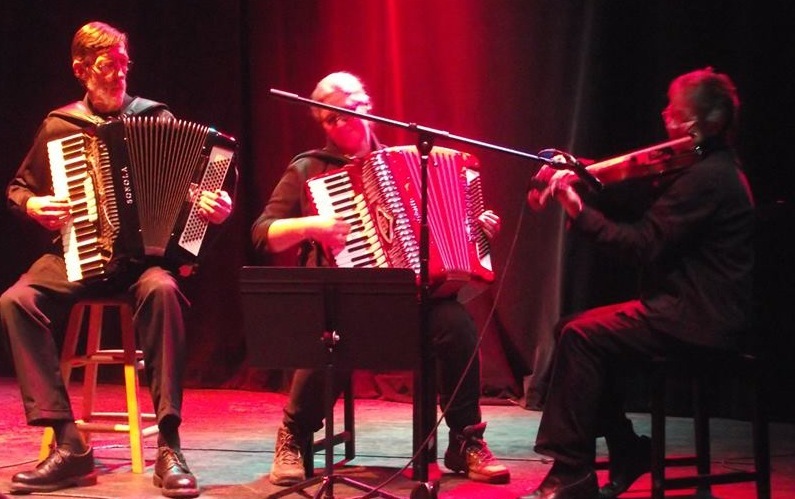 Ed Marris/accordion, Jeanne Palmer/violin, and Franziska Rauch/accordion all started playing their instruments as youngsters and quit in their teens, finally inspired to come back around as much older adults. You last saw them perform at the stage of the Roxbury Arts Center at 2014’s Catskill Follies. Ed Marris played french horn in college and then piano and percussion, getting back with the accordion in his 50’s with the eclectic roots/world music band “Stone Soup” from Rochester, NY and then with the gypsy jazz trio “Lumiere”. He’s also spent most of his adult life as a carpenter and woodworker and operates an accordion restoration, repair, and tuning business in Pine Hill, the Accordion Workshop. Jeanne Palmer lives in Roxbury and played piano and violin in her youth, rediscovering her passion for the violin when she came to Roxbury over 10 years ago. She was a musical theater director and choreographer in her native Missouri and in NYC and has been working in the book publishing business in NY for many years. She and Connie Mohar formed a duo and play for many private parties and weddings in the area, and may be heard at the Round Barn on Saturdays during the summer. Franziska Rauch played accordion as a child in Germany, coming to the US as a young adult and making a place for herself in the textile design business in NY. Moving to the Catskills about 20 years ago, she established Blue Ice Clothing in Pine Hill and started playing accordion again in the local music scene. She plays several genres of music in several bands. They are all especially grateful for the Roxbury Arts Group’s support of local performing artists. “It provides a venue for us and for the inspiring first class national talent that fills the hall throughout the annual Concert Series.